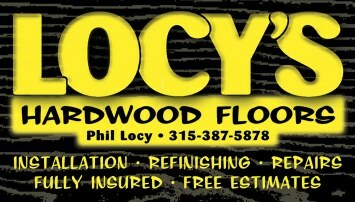 We at Locy's Hardwood Floors offer a variety of flooring services for today's homeowner. Lock glueless system floors, engineered flooring, glue-down, and floating floor systems. Refinishing is a great way to restore your hardwood or parquet floors' beauty and length of use. So if you've had a new furnace or plumbing installed and you have to repair the holes in the floor from the old system, call us and we can do it.